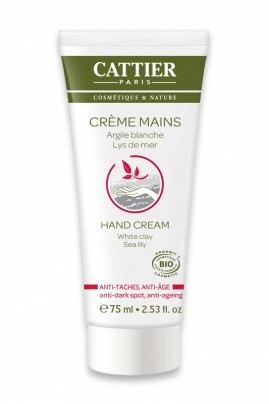 Cattier Organic Anti Dark Spots Hand Cream hydrates* and nourishes your hands while blurring age signs. Natural Sea Lily is a highly efficient dark spot corrector, it targets pigmentary spots to visibly diminish their size, colour and number. Used day and night, Cattier Natural Hand Cream lightens dark marks and makes them less noticeable, fine lines and wrinkles are smoothed. Your hands recover their natural beauty and youth ! Cattier Hand Cream is your weapon for spot-less soft hands ! Apply CATTIER Anti Dark Spots Anti Age Organic Hand Cream on your hands day and night. So many organic natural ingredients to pamper and protect your hands !